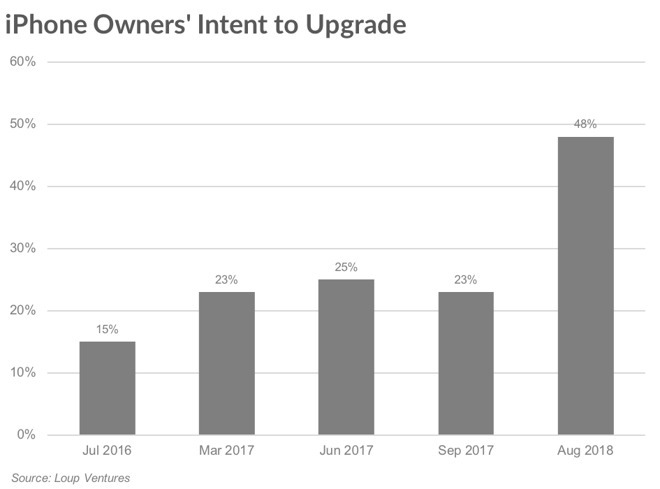 A new survey by Loup Ventures ahead of the arrival of this year's iPhone lineup found that 48 percent of current iPhone owners plan to upgrade in the next year. That number compares to 25 percent when the survey was taken in June of 2017. While authors Gene Munster and Will Thompson note that the survey result is an outlier, they believe that the survey is nonetheless "a positive indicator of upcoming iPhone demand," one that could deliver three percent unit growth in FY19. Wall Street consensus sees flat growth. In addition, of those surveyed who plan to get iPhones, 42 percent say they'll buy one from the 2018 line, 18 precent say they'll opt for an iPhone X. And 19 percent of current Android phone owners said they plan to switch to an iPhone in the next year. "iPhone is entering a period of stability (0% to 5% unit growth for the next several years, driven by 805m+ active iPhones with a high (90%) retention rate," the authors wrote. "Assuming a 3.5-year upgrade cycle and a 90% retention rate implies 207m iPhones sold each year, slightly below the Street's 219m expected in FY18 and FY19." While Loup Ventures has been putting forward the idea this year that services will become an ever-larger part of Apple's future, Munster has been bullish on iPhone sales as well. Apple is expected to unveil three new iPhones, most likely in the second week of September. Current speculation suggests there to be two updated OLED models, measuring 6.5-inches and 5.8-inches, along with a lower-specification 6.1-inch LCD variant, with all having physical designs similar to the iPhone X.